A short bus, shuttle or taxi ride from Main Street will land you in Park City’s Prospector Square, which boasts a number of hidden gems for off-Main dining. Hans Fuegi’s Grub Steak Restaurant (2200 Sidewinder Drive, 435-649-8060) has outlasted most Park City eateries by serving up a bounty of beef, game and rib dishes along with poultry, fish and seafood at fair prices. Start off with the grilled artichoke and work your way up to the Grub Steak’s hunter’s mixed grill, featuring beef tenderloin, elk sirloin and wild-boar sausage. Vegetarians might prefer Houman Gohary’s Good Karma (1782 Prospector Square, 435-658-0958, pictured at left), which offers a healthy variety of vegetarian options in addition to meat, poultry and seafood. 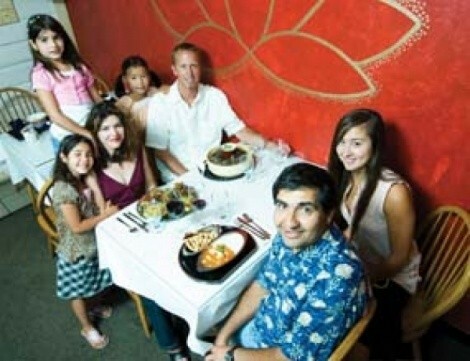 The cuisine here is a fusion of Indian and Persian—the only Indo-Persian restaurant in Utah. But don’t get the notion that this is your typical masala or kebab joint. Gohary’s one of the most talented chefs I know, and his cuisine is refined and creative—as exemplified by a dish like golden beet and tomato salad with mint vinaigrette and mango. By the way, Good Karma also serves breakfast and lunch. At Fuego Bistro and Pizzeria (2001 Sidewinder Drive, 435-645-8646) in Prospector, you’ll find luscious apps like beef tenderloin carpaccio with arugula, a killer meatball-and-pasta-fagioli soup, smokin’ wood-oven-fired pizzas and entrees like shrimp & clam linguini, lasagna and good old spaghetti & meatballs. Just down the road is Cafe Trang (1811 Sidewinder Drive, 435-655-8884), with an extensive array of Vietnamese fare, supplemented by Chinese and Thai selections. The lemon grass noodle salad is terrific, and I love the Hanoi tofu with vermicelli. Over at 1821 Sidewinder Drive, Nacho Mama’s (435-645-8226) dishes up Tex-Mex goodies like its great green-chile burger, slow-cooked pork carnitas, enchiladas, chalupas and, of course, nachos. The word at Sundance has long been out about the Blind Dog (1781 Sidewinder Drive, 435-655-0800), so you might have to share a space with Parker Posey, but then, who wouldn’t want to? Especially if kasu-marinated black cod is on the menu, or the Blind Dog’s famous lump blue crab cakes. Get really Sundance-y with a star-power dish of butternut-squash ravioli in brown butter with sage and duck confit. Over at Park City Mountain Resort, Boua’ Thai (1385 Lowell Ave., 435-649-2682) is the place for fiery panang and massaman curries and the chef’s specialties like Chicken Volcano and his Tiger Tear beef. Mainstays of pad Thai and satay at Boua’ are terrific, too. Just down and around the bend from PCMR is Squatters Roadhouse Grill (1900 Park Ave., 435-649-9868), which offers something hard to find during Sundance: parking. Along with Squatters’ award-winning microbrews, you’ll find unique pub favorites like jambalaya, tofu-and-fish tacos, tandoori chicken and a wide array of burger options from buffalo and turkey to the popular chef’s veggie burger. For Greek food, try Nick’s Creek Café (1600 Snow Creek Drive, 435-658-2267), where you’ll find authentic Greek dishes like house-made spanakopita, pastitsio, dolmades and moussaka, in addition to gyros, souvlaki and baklava. A few doors down from Nick’s is Flippin’ Burgers (1300 Snow Creek Drive, 435-658-1809), serving 100 percent certified Angus beef burgers, terrific skin-on fries, beer, malts, shakes and a fiery collection of hot sauces.